Ipswich missed the chance to move into the Championship top six as fellow play-off hopefuls Bournemouth twice fought back to earn a draw. Town went ahead when Paul Anderson steered in Cole Skuse's low cross, but the Cherries soon levelled through Steve Cook's overhead kick. Paul Green's close-range header looked to have given Ipswich the win. But there was a late twist as Matt Ritchie's deflected free-kick denied the hosts. The result was one that neither side wanted, as both failed to capitalise on sixth-placed Brighton's failure to win at home against struggling Blackpool. It leaves Ipswich eighth, one point off the top six, with Bournemouth two points further adrift with two matches remaining. Ipswich have been in the second tier of English football for 12 seasons, more than any other club currently in the Championship. The Cherries had gone into the game with hopes of reaching the top flight for the first time in the club's history. But, although still mathematically possible, Eddie Howe's side need a host of results to go their way. However Ipswich, who have been out of the Premier League for 12 years, still harbour ambitions of a return to the top division, even though they face a tricky away game at already-promoted Burnley next week and need Brighton to drop further points. In front of 20,356 - the highest home crowd of the season at Portman Road - Ipswich went ahead against the run of play in the 36th minute. Bournemouth had missed two good opportunities through Yann Kermorgant and Eunan O'Kane and those misses proved costly as Anderson got on the end of Skuse's delivery and fired a shot into the roof of Lee Camp's net. But the lead only lasted for eight minutes before Cook's spectacular equaliser. Green had only been on the field for 11 minutes when he put Ipswich back ahead. However, Bournemouth again fought back with Ritchie's deflected free-kick making it 2-2. Neither side settled for a point and Ipswich's Tyrone Mings came closest to netting a winner but his glancing header went just past a post as it ended level. Ipswich manager Mick McCarthy told BBC Sport: "It was a hard-fought game, a really good advert for the Championship. "We were at a disadvantage as we played Saturday, Monday and they played on Friday, Monday. But I can't express the pride that I have for the lads. They do the job every day, put the effort in and they are an honour to the shirt. At the end of the game we were running in empty. "We have two games left and we will see what happens. This time last year we were not safe from relegation so I'm a damn sight happier at the top of the table. "This league is bonkers. Everyone desperately wants to go up and that's why it's hard to grasp a play-off place." Bournemouth manager Eddie Howe told BBC Sport: "I thought we were the better team, we created the better chances and played the better football. "Both teams went for the win at the end and we threw the kitchen sink at them but could not get that golden chance. "If we don't make the play-offs this year then the signs are good for next season. "The pleasing thing is that we didn't give up. The lads chased the game as good as they've done." Match ends, Ipswich Town 2, Bournemouth 2. Second Half ends, Ipswich Town 2, Bournemouth 2. Attempt missed. Yann Kermorgant (Bournemouth) header from the centre of the box is close, but misses the top right corner. Assisted by Eunan O'Kane with a cross. Corner, Ipswich Town. Conceded by Adam Smith. Tyrone Mings (Ipswich Town) wins a free kick in the defensive half. Attempt blocked. Matt Ritchie (Bournemouth) left footed shot from the right side of the box is blocked. Assisted by Simon Francis. Corner, Bournemouth. Conceded by Frazer Richardson. Corner, Bournemouth. Conceded by Dean Gerken. Attempt saved. Lewis Grabban (Bournemouth) right footed shot from outside the box is saved in the bottom left corner. Assisted by Adam Smith. Offside, Bournemouth. Lee Camp tries a through ball, but Yann Kermorgant is caught offside. Offside, Bournemouth. Matt Ritchie tries a through ball, but Lewis Grabban is caught offside. Attempt saved. Yann Kermorgant (Bournemouth) right footed shot from outside the box is saved in the bottom left corner. Attempt missed. Tyrone Mings (Ipswich Town) header from the centre of the box misses to the right. Assisted by Aaron Cresswell with a cross following a set piece situation. Hand ball by Simon Francis (Bournemouth). Frank Nouble (Ipswich Town) wins a free kick in the defensive half. Andrew Surman (Bournemouth) wins a free kick in the attacking half. Foul by Paul Green (Ipswich Town). Goal! Ipswich Town 2, Bournemouth 2. 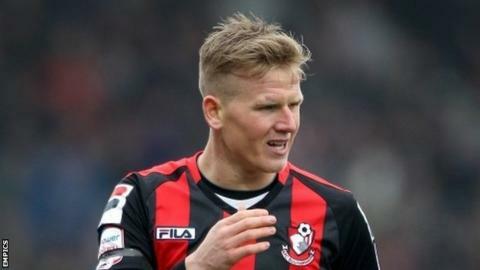 Matt Ritchie (Bournemouth) left footed shot from outside the box to the bottom left corner. Assisted by Andrew Surman following a set piece situation. Tokelo Rantie (Bournemouth) wins a free kick in the attacking half. Attempt missed. Tokelo Rantie (Bournemouth) right footed shot from outside the box misses to the right. Assisted by Lewis Grabban following a fast break. Attempt blocked. Luke Chambers (Ipswich Town) right footed shot from outside the box is blocked. Corner, Ipswich Town. Conceded by Andrew Surman. Dangerous play by Steve Cook (Bournemouth). Substitution, Ipswich Town. Tyrone Mings replaces Jonathan Williams. Offside, Bournemouth. Eunan O'Kane tries a through ball, but Tokelo Rantie is caught offside. Offside, Bournemouth. Andrew Surman tries a through ball, but Matt Ritchie is caught offside. Corner, Ipswich Town. Conceded by Steve Cook.